TokoBooks is dedicated to creating fun, engaging children’s books that promote a positive self-image and inspire a rewarding life. 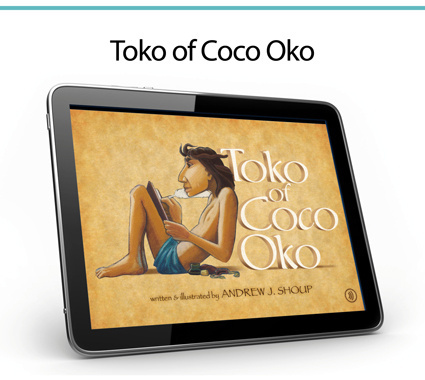 Summary: Toko lives on the tiny tropical island of Coco Oko. Follow him on his journey as he attempts to find his place among his fellow Coco Okoans. With the help of The Great Coconut and the oldest living Coco Okoan, Toko discovers where he fits in. STORY – Includes narration and animation. ACTIVITIES – Banana Cream Pie Baking Video and Recipe, Crazy Coconut Pinball Game, Creating a Children’s Picture Book Video, Writing & Illustrating Exercise, Jigsaw Puzzles, Coloring Pages, Virtual Steel Drum, Word Search, Crossword, Shell Board Game, Tikis and Moai Video, Dancing Moai, Paper Moai Project, Salsa and Rhumba Dance Instruction, Meditation Practice and Bonus Stories. EXTRAS – Tiki Mug Creation, Moai Book, Steel Drum Music, Steel Drum Manufacturer, Dance Instruction, Meditation Instruction, Cooking Instruction and much more. ACTIVITIES – Quiz, Apple Dumpling Baking Video and Recipe, Apple Dumpling Pinball Game, Creating a Children’s Picture Book Video, Writing & Illustrating Exercise, Apple Basket Maze Games, Jigsaw Puzzles, Coloring Pages, Piano Keyboard, Word Search, Crossword, Memory Game, Apple Basket Race Board Game. 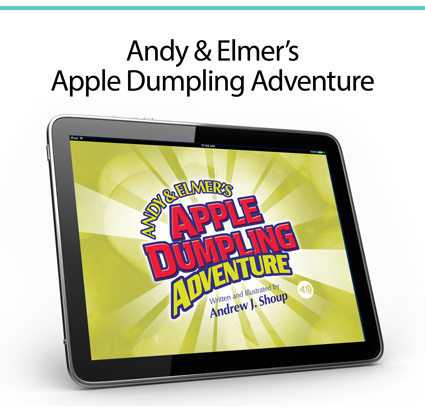 EXTRAS – About Rotary International®, History of The Four-Way Test, About the Andy & Elmer Literacy Project and much more. Learn about the literacy program associated with this book.